In today’s competitive marketplace, an unexpected outage can easily lead to missed deadlines, frustrated customers, reduced orders, and debilitating long-term damage to your business. 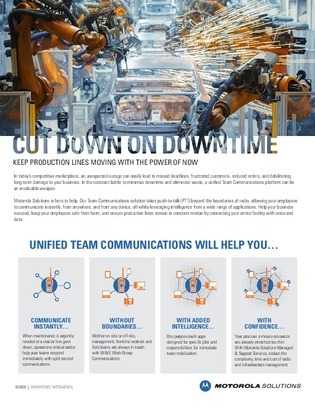 In the constant battle to minimize downtime, a unified team communications platform can be an invaluable weapon. Learn about a platform designed to take push-to-talk beyond the boundaries of radio, allowing employees to communicate reliably and in real-time from anywhere and on any device.